Dig-It! Games has developed a wonderful new game about the Mayan culture called Mayan Mysteries. We were chosen to play and review the online version of the game, but it is also available on the Ipad as an app. 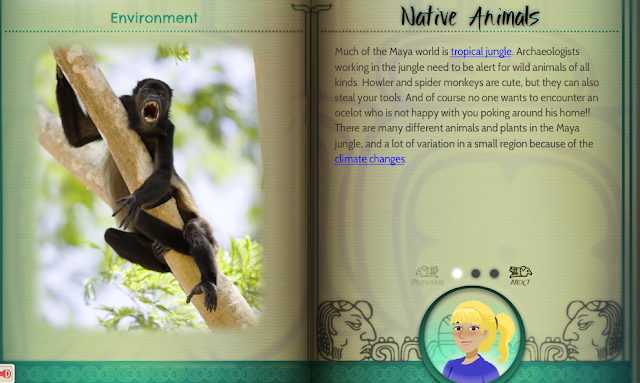 Here is a quick introduction to the game from the Dig-It Games website: Mayan Mysteries blends action and mystery with history and learning, presenting players with unique adventure through the fascinating world of the ancient Maya. Visit excavation sites, decode glyphs, explore the mysterious Maya calendar, and more in this exciting educational journey. This puzzle-based game has more than just puzzles--it has tons of opportunities for you and your child to learn history, geography, social studies, archaeology, critical thinking and reading comprehension. I loved the many layers of the game. The graphics are beautiful and engaging. 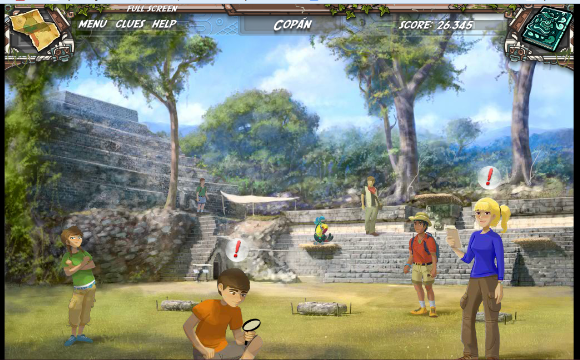 Once the players choose a Central American country to visit from the opening map, they are taken to a screen like the one below. Each exclamation point above the research teams' heads mean they have some vital information and clues. Clicking on them will bring up their information, chock full of facts and links to explore. Here is very important bonus: each screen with lots of information has a "read to me" option, which really helped my daughter to absorb it and move through the game more quickly. Throughout the game, the players have a chance to play games that reinforce what they have just learned. Below is an example of one of the games Abbey enjoyed playing the most. This is the critical thinking part of the game, and as a mom, I loved that. Warning: as you can see below, some of the content about religious sacrifices is a bit harsh, but it was very real part of the Mayan culture, and Abbey (age 9) was not upset by it. Some younger children may be, however, so I recommend playing alongside your younger children if this is a concern for you or for them. To be clear, there are no violent images or content. After each section, the students are asked to do a "Challenge" in order to gain clues and artifacts. Although Abbey played this daily, we have yet to reach the end of the game. She still has many levels yet to go. I actually love that fact; the many layers of the game are part of what make this such a great value. The "challenges" are review questions, forcing the players to actually absorb some of the information and then recall it in order to move to the next level. I think it is a very clever way to add in reading comprehension! Your student is learning without realizing it! 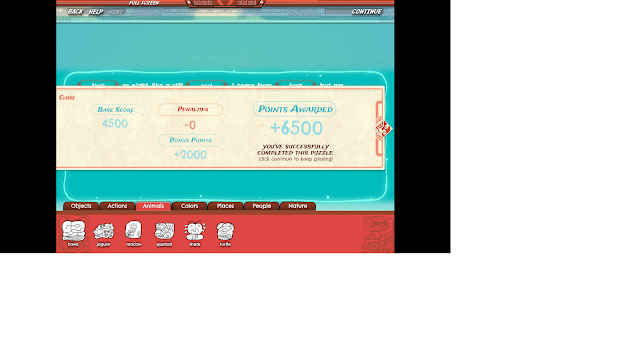 Here is a screen shot that shows how many points Abbey gained from one of her challenges and puzzles. The main screen also lets the player know which levels and artifacts they have collected and which ones they still need to obtain. Side note: I would love to see a screen or section added to the game to see which questions in the challenges the students missed, so we could review those particular facts again, but this did not distract from the overall learning value of the game. 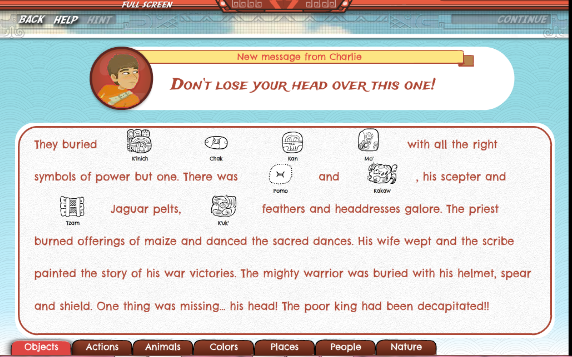 Mayan Adventures from Dig-It! Games is recommended for ages 11 to 18, but as you can tell from my review, younger children can play this game with help from a parent or older sibling. A single user license is $21.99 for PC or Mac and an Ipad app is $9.99 per download. I consider this to be a fair price for the amount of learning opportunities that are built into this unique game. Guess what? Other Crew Mates of mine also reviewed both the online and Ipad app versions, so please click the banner to see what they thought of the game!